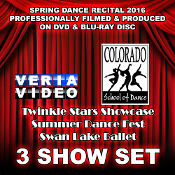 Select a combination of any 2 Shows from CSD's Annual Spring Recital 2016 on DVD and / or Blu-ray Disc. Veria Video In Association With The Colorado School of Dance in Parker, Co presents the Twinkle Stars Showcase, Summer Dance Fest Showcase and Swan Lake Ballet production!. The estimated time of completion / delivery is 6 - 8 weeks after filming of event. Digital Copy HD downloads will also be made available for download! See new option & pricing below!